BACKGROUND AND PURPOSE: Mechanical thrombectomy in ischemic stroke is of increasing interest as it is a promising strategy for fast and efficient recanalization. Several thrombectomy devices have been introduced to the armentarium of mechanical thrombectomy. Currently, new devices are under development and are continuously added to the neurointerventional tool box. Each device advocated so far has a different design and mechanical properties in terms of thrombus-device interaction. Therefore, a systematic evaluation under standardized conditions in vivo of these new devices is needed. The purpose of this study was to evaluate the efficiency, thrombus-device interaction, and potential complications of the novel Phenox CRC for distal mechanical thrombectomy in vivo. MATERIALS AND METHODS: The device was evaluated in an established animal model in the swine. Recanalization rate, thromboembolic events, vasospasm, and complications were assessed. Radiopaque thrombi (2 cm length) were used for the visualization of thrombus-device interaction during retrieval. The Phenox CRC (4 mm diameter) was assessed in 15 vessel occlusions. For every occlusion a maximum of 3 retrieval attempts were performed. RESULTS: Complete recanalization (TICI 3/TIMI 3) was achieved in 86.7% of vessel occlusions. In 66.7% (10/15), the first retrieval attempt was successful, and in 20% (3/15), the second attempt led to complete recanalization of the parent artery. In 2 cases (13.3%) thrombus retrieval was not successful (TICI 0/TIMI 0). In 1 case (6.7%) a minor embolic event occurred in a small side branch. No distal thromboembolic event was observed during the study. Thrombus-device interaction illustrated the entrapment of the thrombus by the microfilaments and the proximal cage of the device. No significant thrombus compression was observed. No vessel perforation, dissection, or fracture of the device occurred. CONCLUSIONS: In this small animal study, the Phenox CRC was a safe and effective device for mechanical thrombectomy. The unique design with a combination of microfilaments and proximal cage reduces thrombus compression with a consequently high recanalization and low complication rate. One aspect might be the compression of the thrombus during retrieval due to the application of force to the distal end of the thrombus.12 Each device advocated so far has a different design and mechanical properties in terms of thrombus-device interaction,12,13 and systematic evaluation is therefore crucial. The Phenox CRC (Phenox, Bochum, Germany) device is a modification of the pCR device,8,14,15 adding an additional self-expanding cage at the proximal end of a brushlike device. To date, no systematic evaluation of the device is available in the literature. The present study was performed in an established animal model by using radiopaque thrombi to evaluate the efficiency, thrombus-device interaction, and potential complications of the Phenox CRC device for distal mechanical thrombectomy in vivo. The Phenox CRC is a modification of the pCR (European CE-marked since 2006).8,14,15 It consists of a highly flexible nitinol/platinum-alloy core wire compound. This wire compound holds radially oriented polyamide microfilaments and is marked by radiodense markers on the proximal and distal ends. The fibers have a preferential proximal direction, and the contour of this brushlike device is trimmed in a conical shape with an increasing diameter distally. The filament compound is resilient against unraveling. Its proximal end has been modified and is additionally wired by a self-expanding nitinol basketlike cage (Fig 1). Two diameters are available: 2 mm proximal increasing over a length of 2 cm to 4 mm distally (Phenox CRC 2-4-20), and 3 mm increasing over a length of 2 cm to 5 mm distally (Phenox CRC 3-5-20). The device is firmly molded to the body of a 3-m-long 0.4-mm pusher wire. The Phenox CRC and its pusher are positioned in an insertion tube and are delivered through a braided 0.027-inch microcatheter (Rebar-027, 2.8F; ev3, Irvine, California, or Renagade Hi-Flo, 2.8F; Boston Scientific, Natick, Massachusetts, are recommended). The use of a 6F to 8F guide catheter is generally recommended. In this study a 7F guide catheter (Guider Softip, Boston Scientific) was used as a guide catheter. Equipped with a microwire (Silver Speed 0.014; ev3) the microcatheter (Rebar-027, 2.8F; ev3) was navigated into the occluded vessel and the thrombus was passed. After successful placement of the microcatheter 1 to 2 cm distally to the thrombus, the microwire was pulled out and the Phenox CRC was inserted by using a Y-shaped connector/valve and the insertion tube. Only the Phenox CRC 2-4-20 with a maximal distal diameter of 4 mm was included in this study. The device was deployed 1 to 2 cm distal to the thrombus by retrieval of the microcatheter. Once deployed the Phenox CRC cannot be pulled back into the microcatheter. Finally, both the Phenox CRC and the microcatheter were pulled back simultaneously to contact the thrombus and were retrieved into the guide catheter. During retrieval, continuous aspiration was applied through the guide catheter by using a 60-mL syringe to avoid embolization of thrombus fragments. Graphic illustration (A) and photograph (B) of the Phenox CRC device. The core wire compound holds radially oriented polyamide microfilaments trimmed in a conical, brushlike shape. The proximal end is additionally wired by a self-expanding nitinol basketlike cage. Radiodense markers are at the proximal and distal ends (asterisks). The Phenox CRC after successful clot retrieval (C). Note the encasement of the clot by the cage at the proximal end. Thrombus preparation and application were described in a previous study on this animal model.12,13,16 In brief, thrombi were created by mixing 10 mL of autologous blood of the animal with 1 g of barium sulfate and 0.25 mL of bovine thrombin solution (Dade Behring, Newark, New Jersey). The material was incubated for 1 hour at room temperature and cut in thrombi of 20 mm length, which were injected into the target vessel. Due to the radio-opacity gained by the added barium sulfate, thrombus movement and thrombus-device interaction were visualized and evaluated during angiography and fluoroscopy. Selective intra-arterial digital subtraction angiography was performed on a biplane high-resolution angiography system (Axiom Artis zee; Siemens, Erlangen, Germany). Iopamidol (Iopamiro 300; Bracco, Milan, Italy) was used for vessel contrast. After initial angiography of the cranial vessels, selective angiography of the cranial and supra-aortic vessels was performed. These vessels reproduce the anatomic setting of an occlusion of the middle cerebral artery and the basilar artery in the human circulation,16 which are the common localizations for interventional stroke therapy. Mean vessel diameter was 2.8 ± 0.5 mm (range, 2.0–4.1 mm; median, 2.7 mm), corresponding well with the target vessels in humans as well as with the diameter of thrombi extracted from cerebral vessels of stroke patients.17 For selective thromboembolization the preformed thrombus was injected into a 7F guide catheter (Guider Softip) positioned in the target vessel. After thrombus application the guide catheter was removed for 5 minutes to restore arterial flow and to allow thrombus embedding. The precise localization of the thrombus and complete occlusion of the vessel were assessed by follow-up angiography. The retrieval attempts were conducted according to the recommendations of the manufacturer as described previously. During retrieval only the microwire, microcatheter, and the Phenox CRC entered the target vessel. For each attempt a new device was used. The number of attempts to retrieve the thrombus was limited to 3 for each vessel occlusion. After the third attempt the clot retrieval was rated as failed. The application time for the initial attempt as well as for the following attempts was recorded. The device was evaluated in 15 vessel occlusions. All retrieval maneuvers were documented digitally, assessing thrombus fragmentation and peripheral embolization. Follow-up angiography was performed immediately and 1 hour after the procedure to evaluate recanalization rate, vessel dissection, vasospasm, or perforation. Thrombus movement, fragmentation, and possible distal dislocation during the passing procedure with the microwire or microcatheter and during delivery of the device were analyzed. Thrombus fragmentation or loss with possible thromboembolization in other vessels during retrieval was assessed. Recanalization rate of the parent vessel by using the TICI grading scale (0 to 3)18 and the scale for TIMI (0 to 3) was evaluated.19 For statistical evaluation, TICI/TIMI grades 0 and 1 were rated as insufficient and TICI/TIMI grades 2 and 3 were rated as sufficient recanalization. Grading of vasospasm in case of recanalization according to a scale introduced by Grandin et al20 was used as follows: 0 = no narrowing; 1 = slight narrowing (<25% reduction in lumen diameter); 2 = moderate narrowing (25%–50% stenosis or 50%–75% stenosis affecting only a short segment of vessel); and 3 = severe narrowing (50%–75% stenosis affecting a long segment of vessel or any stenosis >75%). The retrieval success was evaluated regarding recanalization rate and number of attempts to complete thrombus retrieval as well as the total time interval to achieve recanalization, loss of thrombotic material at the tip of the guide catheter, and feasibility and technical failure. A total of 22 retrieval attempts for recanalization were performed on 15 vessel occlusions. Initial deployment of the device distal to the thrombus was feasible in all cases. Complete recanalization (TICI/TIMI 3) was achieved in 86.7% of vessel occlusions (13 of 15 occlusions). In 66.7% (10/15), the first retrieval attempt was successful (Fig 2), and in 20% (3/15) the second attempt led to complete recanalization of the parent artery (Fig 3). In 2 cases (13.3%) thrombus retrieval was not successful (TICI/TIMI 0) and no clot material could be retrieved. Location of vessel occlusion, number of attemps per vessel, and recanalization results are summarized in the Table. No vessel straightening, indicating high friction during retrieval, occurred in the failed attempts. Mean number of attempts for recanalization was 1.7. Mean time to recanalization was 7 minutes 20 seconds (range, 1–29 minutes). Angiogram of the lingual artery before embolization (A). Passing of the microcatheter and microwire between thrombus and the vessel wall (B). Unsheathing of the Phenox CRC distally to the thrombus (C; proximal and distal markers: arrows). Retrieval of the device (D–F). The thrombus is mobilized in a stretched position (arrows) by the device during retrieval without compression or compaction. Deployment of the device distal to the thrombus (A; distal marker: arrow). Device retrieval (B; distal marker: arrow). Partial recanalization after first retrieval attempt with residual thrombus (C; thrombus: arrow). Passing of the residual thrombus in a second attempt (D and E; arrows) and retrieval of the entire residual thrombus (F; arrow). Vasospasm rate was grade 0 in 20.0% (3/15), grade 1 in 33.3% (5/15), grade 2 in 20.0% (3/15), and grade 3 in 26.7% (4/15). Mean vasospasm rating after recanalization was 1.5. At follow-up angiography after 1 hour, vasospasms usually had resolved, allowing assessment of the recanalization result. In 1 case (6.7%) the distal part of thrombus was lost in the carrying vessel leading to a minor embolic event in a small adjacent side branch, but no distal thromboembolic event in the target vessel or previously unaffected vessel territories was observed. 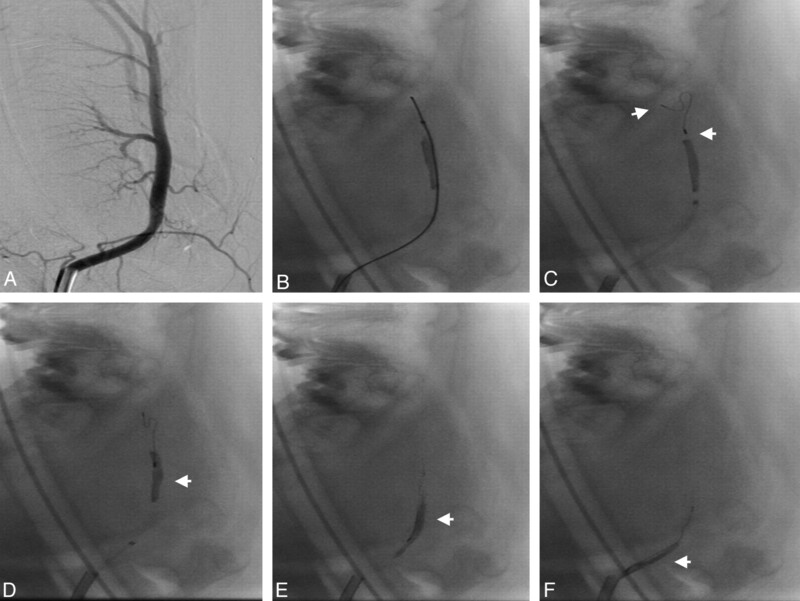 Neither vessel perforation nor vessel dissection was found during control angiography. There was no device fracture during the study. The passage of the thrombus with the microcatheter and microwire was possible in all cases and never led to distal dislocation or fragmentation of the thrombus. In all cases passing of the thrombus occurred between the thrombus and the vessel wall without penetrating the thrombus, consistent with the findings in other studies12,13,21 and clinical experience. Unsheathing of the device distally to the thrombus was feasible without complications. However, deployment of the device can be complicated by restricted space distal to the thrombus due to branching or narrowing of the target vessel. Thrombus-device interaction illustrated the entrapment of the thrombus by the proximal cage and the microfilaments of the device. Typically, the thrombus was encased proximally by the cage and loaded lengthwise as a whole by the microfilaments depicted by a subtle radiolucent rim between the opacified thrombus and the core wire. During mobilization the thrombus remained in a stretched position, which avoids thrombus compaction during retrieval. Consecutively, no significant thrombus compression occurred (Figs 2 and 4). 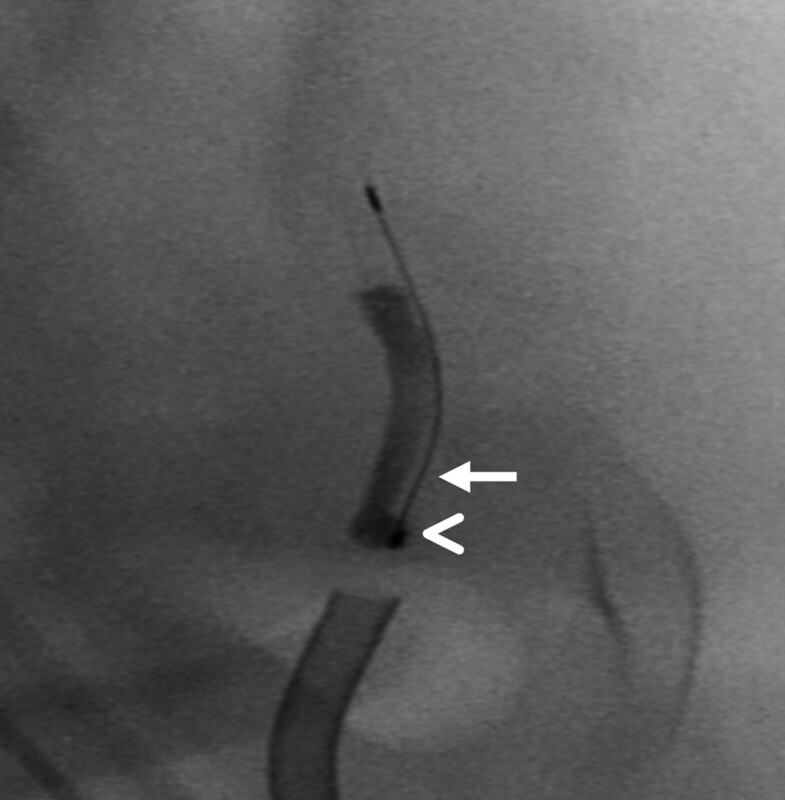 Fluoroscopic magnification during retrieval showing encasement of the thrombus proximally by the cage (arrowhead) and lengthwise loading of the thrombus by the microfilaments depicted by a subtle radiolucent rim between the opacified thrombus and the core wire (arrow). In 1 case pulling back of the device led to dislocation of the thrombus by pushing it in a proximally located side branch. No shearing off of the thrombus from the device into the side vessel occurred. 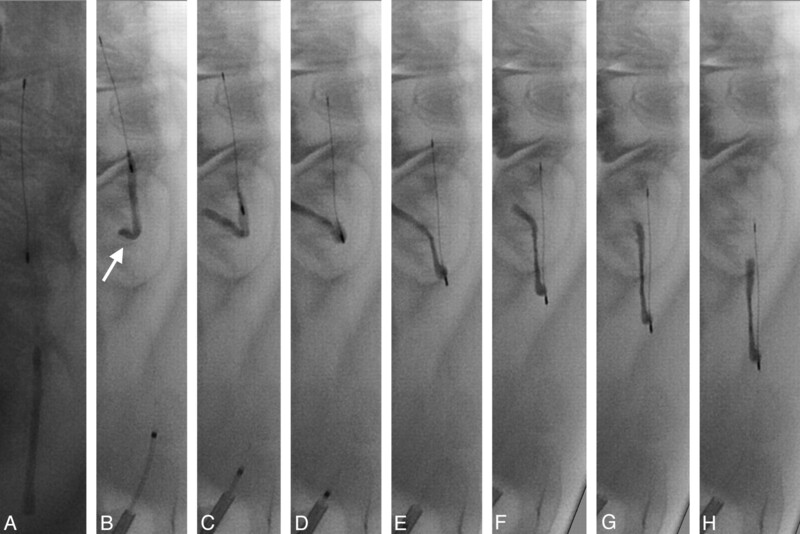 The engagement of the proximal tip of the thrombus by the cage led to stable fixation of the thrombus and enabled retrieval from the side branch without embolization (Fig 5). Deployment of the device distally to the thrombus (A). Retrieval of the device leads to dislocation of the thrombus into a proximal side branch (B–D; arrow). Fixation through engagement of the proximal tip of the thrombus by the cage enables retrieval from the side branch without embolization (E–H). During retrieval no shearing off of the thrombus from the device into the side vessel occurred. Retrieval of the device into the guiding catheter was uneventful in all cases, and no loss of thrombotic material at the tip of the guiding catheter was observed by using additional aspiration. The interest in mechanical thrombectomy for acute ischemic stroke has significantly increased in recent years.6,8,10,22 Today, several distal thrombectomy devices with variable designs and shapes and therefore different mechanical properties in terms of thrombus-device interaction have been advocated. Currently, new thrombectomy devices are under development and are continuously added to the armamentarium of interventional stroke treatment. However, mechanical manipulation of a thrombus in the setting of acute ischemic stroke might cause severe complications. Therefore, systematic evaluation of the mechanical properties under standardized conditions in vivo is needed, and animal studies provide an attractive tool for device evaluation and assessment before clinical use in stroke patients. The Phenox CRC device is a modification of the Phenox pCR device,8,14,15 adding an additional self-expanding nitinol cage at the proximal end of a brushlike device. In the present study, the novel device was found to be effective for recanalization with an overall complete recanalization rate (TICI/TIMI 3) of 86.7%. Remarkably, complete recanalization could be achieved in the first attempt in 66.7% of vessel occlusions. After passing of the occlusion site and deployment, distal thrombectomy devices apply force to the distal base of the thrombus. Previous studies on the evaluation of distal thrombectomy devices in vivo have illustrated a large amount of thrombus compression during retrieval. Compression of the thrombus while pulled back increases its diameter and thereby increases the friction between the thrombus and the vessel wall. This situation leads to an increased force necessary to mobilize the thrombus, a reduction in retrieval rate, and more complicated passage maneuvers in the case of additional recanalization attempts as shown in previous studies.12,13,23 Although this observation is difficult to quantify, we have clearly seen in this study that a minimum of thrombus compression during retrieval is a typical feature of the Phenox CRC device. The encasement of the proximal part of the thrombus by the cage seems to add significant additional fixation and stabilization of the thrombus-device complex (Fig 5). 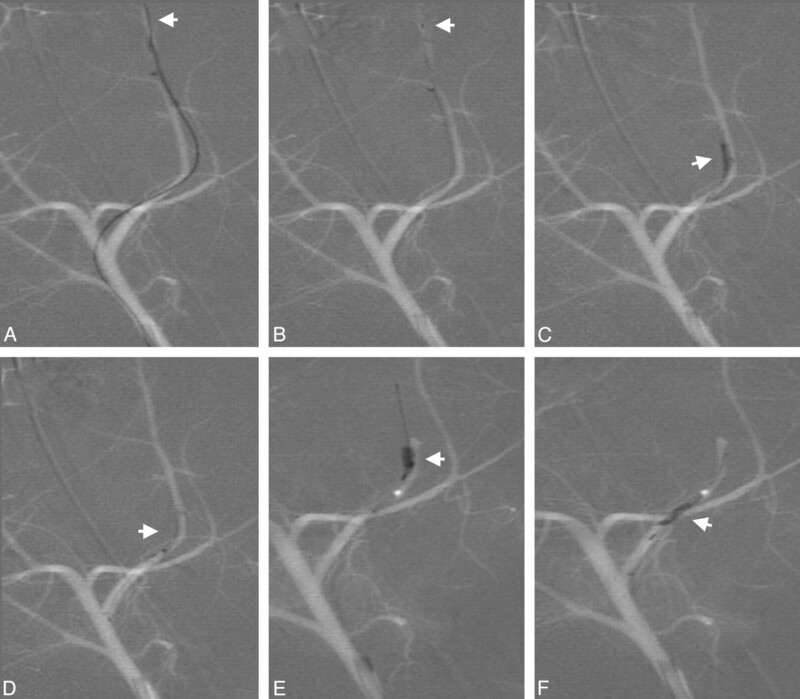 In only 1 case (6.7%) the distal part of a thrombus was lost in the carrying vessel leading to a minor embolic event into a small adjacent side branch, but no distal embolization into the target vessel was observed. This unique design allows effective thrombus mobilization and consecutively high recanalization rates, especially during the first retrieval attempt. The short time to recanalization (mean, 7 minutes 20 seconds) implies the possibility of fast recanalization in the clinical setting. Complications reported in clinical studies of distal thrombectomy devices such as vessel perforation, dissection, or device fracture did not occur in our study. This may be due to the limited number of attempts performed in the study or be biased by the different vessel morphology lacking atherosclerotic changes in the animal model. The device provoked a moderate degree of vasospasm during and after retrieval. However, repeat angiogram after restitution of vasospasm did not reveal any vessel wall damage. Vasospasm is a consistent finding as well in previous studies,12,13,23 reflecting a limitation of the animal model with “young” vessels prone to vasospasm. However, the grade of vasospasm can be considered a measure for vessel wall irritation. The vessels in this animal model are also less tortuous, less elongated, and have less atherosclerotic changes compared with the human vasculature encountered in stroke patients. Studies on thrombus morphology revealed a variety of different thrombi compositions found in human stroke. Although the predominant thrombus is a whole blood thrombus or “red clot,” the composition (eg, fibrin-rich thrombus or white clot) might have a significant influence on the mechanical stability and therefore the success rate of thrombectomy. The used whole blood thrombus conforms to a slightly firm clot. Such clot has different mechanical properties compared with hard clot. The generated whole blood thrombus advocated in this model might therefore not represent the whole spectrum of mechanical properties of thrombi found in acute stroke. Therefore, the success rate of the mechanical device might be overestimated in our model. In this small animal study, the Phenox CRC clot retriever was a safe and effective device for mechanical thrombectomy. 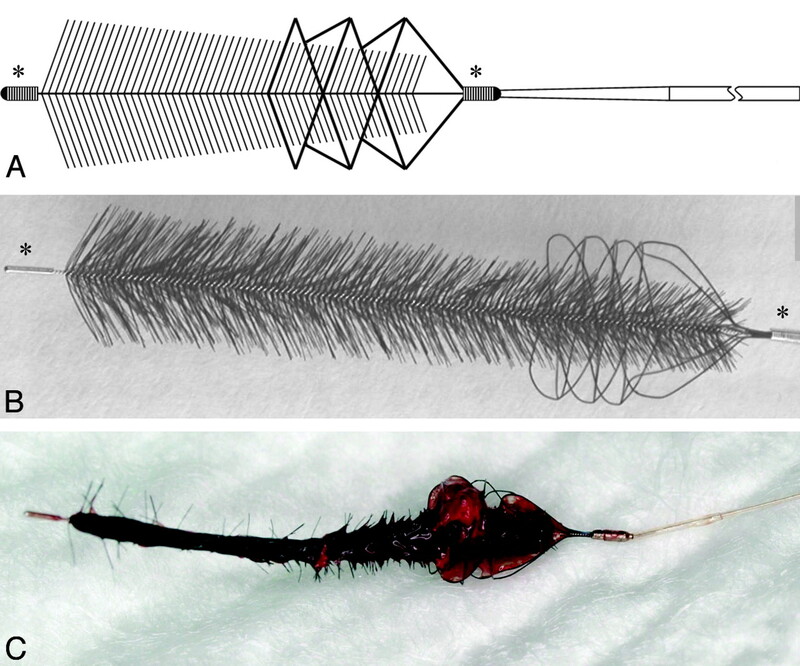 The unique design and mechanical concept with a combination of microfilaments and proximal cage seems to reduce thrombus compression with a consequently high recanalization. The uncomplicated applicability and the atraumatic design due to its flexibility lead to a short time to recanalization and a low complication rate.